Well, it's officially Spring and Easter isn't too far off... so I've been busy with an Easter project that involves bunnies, and then bunnies also became the theme of a set of gifts we sent off to various couples that we know who are expecting this year. 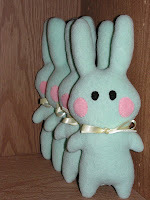 So there are the first 4 of a total of 12 bunnies I've made in the past week. Next up, the Easter bunnies! These will be gifts to our family members - my family in Indiana, and Lucas' family in BC. At the time of this writing I've got 4 of 8 completely finished and the last 4 are halfway done and just in need of some facial features and accessories. Made from the same template, these are also about 10 inches tall and made from fleece with the same fleece and felt features. The biggest difference here isn't the color of the bunnies, but the fact that they come bearing gifts! 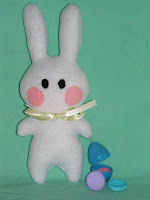 In the left hand of each bunny you can see that it's hol ding a string, and hanging from the string is a tiny plastic Easter egg. Each egg has little hinges that allow you to open it and stick lots of goodies inside. An Easter gift that carries additional gifts... how genius! The real genius with this idea was Lucas, who saw the plastic eggs in a large variety pack at Michael's this weekend. 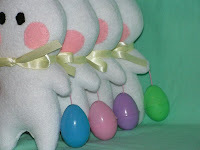 I was originally just going to make 2D eggs from felt to have each bunny hold in their hand, but he saw these eggs and noticed that each had a pinhole in the top so I could easily string them up and sew the string to the bunnies' hands instead. I think they turned out much better this way! Whew! I think once I'm done with all of this and have shipped off the last bunny I won't be making anything that has to do with bunnies for a very long time. Those are such great items for kids! I will have to bear those in mind for the future!